In researching mid-19th Century clothing from a late 20th - early 21st Century vantage point, being confronted by confusing or even contradictory terminology of that period occurs occasionally. To study or reproduce uniforms of the Civil War era, some understanding of period textile lexicon is fundamental even if you don’t weave your own material. Researching these fabrics sometimes involves deciphering arcane terminology in source documentation to determine what textiles were being used for uniform production. Kersey is a fabric type used in Civil War era uniform clothing that is familiar to modern living historians and material culture researchers. The Federal Army’s Quartermaster specified all-wool kersey fabric for uniform coats and jackets, trousers, and greatcoats giving specifications for color, weight per yard and tensile strength. Kersey fabric was originally a product of the English woolen industry. Much of the all-wool English “Army Cloth” run through the Blockade for Confederate uniform production was Kersey. Common perception today is that Kersey is a heavy, 100% woolen fabric woven in a “2 over 2” twill, usually fulled and napped to produce a firm surface finish. Records for Kelly, Tackett, Ford & Company (KT&F), a major Civil War era woolen mill in Manchester, Virginia found in Confederate Papers Relating to Citizens or Business Firms, 1861-65 (files in the National Archives documenting activity and correspondence of various individuals and firms doing business with the Confederate Government) provide information on their textile sales to the CS Quartermaster Department. Many of these document that KT&F supplied “kersey” fabric to the Richmond Clothing Bureau (RCB). These references, particularly those in the 1863 thru 1865 period, seem to contradict the belief that nearly all “woolen goods” made by the Virginia mills were wool/cotton mixed fabrics, in part, due to shortages of “raw” fleece wool once the flow from Texas was curtailed by Union control of the Mississippi River after mid-1863. Closer examination of the KT&F records and an investigation of period terminologies are believed to have clarified this apparent contradiction. Contracts between KT&F and the RCB after 1861 were structured such that the mill agreed to deliver quantities of finished fabric at fixed prices often partially in exchange for raw materials necessary for its production from the Government. This functioned almost like a barter system. The Government procured supplies of bulk, fleece wool from producers as well as other items like cotton “warps” and logwood dyestuffs which they sold to KT&F. This helped stabilize prices for the raw materials (reduced competition) and, in the case of “warps,” was a direct conduit from the mills producing cotton yard goods for the Quartermaster (QM). “Warps” were the length wise yarns used in “wool on cotton fabrics” through which the woolen yarn was woven as” fill” for the finished fabric. 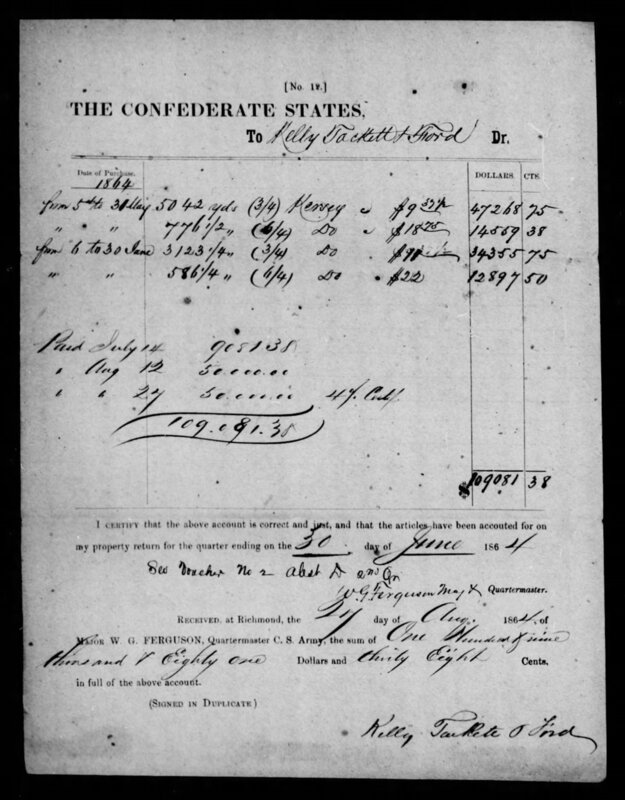 The KT&F records include receipts for purchase of cotton warps from the RCB regularly from the end of 1862 through the end of the war. They also bartered some of the “wool-on-cotton“ fabric they produced for finished cotton osnaburg cloth. In both cases, the price received for their “woolen goods” from the RCB was offset by the value of the materials they received from the Government. Given that KT&F obtained copious quantities of cotton warps from the Government for use in fabric production, the question becomes whether the “kersey” sold to the Government was a different, all wool, fabric they also were producing at the same time? An important clue is perhaps provided in a pair of documents that record KT&F deliveries of bulk fabric to the RCB between 5 May 1864 and 30 June 1864 (Figure 1 and 2). The first is verification that the account records of the payments made for the goods delivered were correct, while the second confirmed that KT&F properly charged for the products supplied per the rates in their contract. Both are dated the same day (24 August 1864), cover the same dates of delivery, record the same yardage received (8165 ¾ yards of ¾ fabric and 1362 ¾ yards 6/4 fabric), and show the same amount expended for “goods received” ($ 109,081.38). The only difference between the two is that one document specifies that the textile received was “kersey” while the other specifies “woolen jeans.” Which was it? Or possibly, was it both? One possible explanation for this apparent paradox is that “kersey” may have been also commonly used as a generic term for course, heavy fabric but without reference to its exact fiber composition. Returning to the definition of “kersey”, the earliest references to this fabric are from woolen industry in Medieval England specifically in Kersey, Suffolk. It was also being woven as early as 1262 in Andover, Hampshire and an Act of 1552 enumerated various kinds of Kerseys being produced. In that period, Kersey was basically short, narrow lengths of wool fabric woven from lower quality wool and more cheaply finished than broadcloth. By the 18th century in England, it was considered a cheaper, coarser substitute for broadcloth among the lower classes particularly for outerwear like coats and trousers. In America, “kersey” along with “linsey,” “Kentucky jeans” and “plains” became associated with inexpensive, durable textiles used in common folk’s clothing and often was “slave cloth” used for making clothing for enslaved persons on Southern plantations (Figure 3). In the first half of the 19th Century such cloth was being produced not only by Southern mills but by Northern mills (particularly in Rhode Island) and on the Plantations themselves. 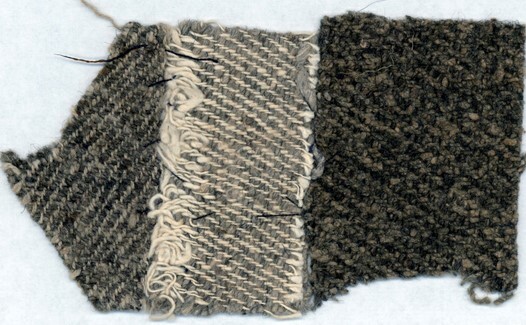 However, these fabrics apparently could be constituted of different fiber types. In a ledger kept by George Washington at Mt. Vernon, a notation from 1770 concerning the work done by a enslaved weaver named George, records that he was “weaving linen and kersey a mixture of cotton and wool.” “Kersey” was, by that time in Virginia, a common term referring to coarse, inexpensive wool/cotton mixed cloth possibly applied when woven with the distinctive “2 over 2” twill weave originally associated with woolen Kersey fabric. Dry goods merchant’s advertisements from the Upper South (NC) in the decades before the Civil War list “kersey” among wool/cotton mix fabrics like “Kentucky jeans”, “satinets” and “cassimeres” for sale (Figure 4). As late as 1915, in a “Dictionary of Textiles” published by the Editor of “Women’s Wear” defined kersey as “A stout, heavy, and pliable twilled all-wool or cotton warp (emphasis the author’s) fabric finished with a close nap; used for coats.” Today “wool on cotton warp” fabric woven in a 2 over 2 twill is usually called cassimere but the two may have been somewhat interchangeable in the Civil War era. Interestingly, in the 18th Century, cassimere was defined as a medium-weight twilled all-wool cloth of soft texture, that also was known as Kerseymere. Was “kersey” in the KT&F records a slang reference used at the RCB to describe any heavy, coarse wool/cotton mixed fabric? Did the “2 over 2” twill weave differentiate it from jeans or satinet? Or was “kersey” the term used by KT&F themselves for cassimere (which is used in records by other Virginia mills providing fabric to the RCB)? No existing documentation has been found that absolutely resolves these questions but from the evidence it is believed “kersey” references in the KT&F records were not to all-wool fabric but was a wool/cotton mixed textile made, in part, from those cotton “warps” they purchased from the RCB. In this case “kersey” was not Kersey. Milstead, Richard, Richmond Depot Jackets – Characteristics, Anomalies, and Myths, Liberty Rifles web site, www.libertyrifles.org/research/uniforms-equipment/richmond-jackets, March 2018. Records for Kelly, Tackett. 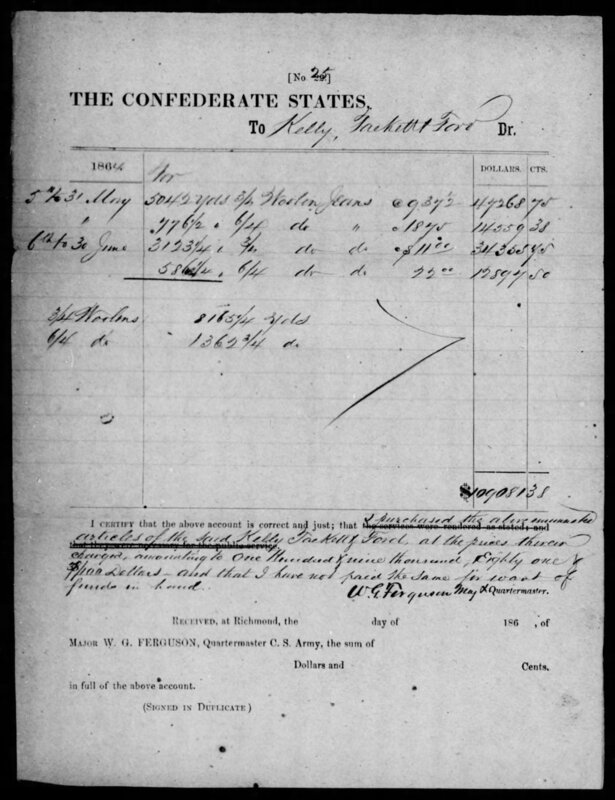 Ford and Company, Confederate Papers Relating to Citizens or Business Firms, 1861-65, Roll 0538, Microfilm Publication M346, Record Group 109, National Archived and Records Administration, Washington D.C (hereafter KT&F Records). KT&F Account summaries 24 August 1864, Ibid. KT&F Records. Shaw, Madelyn, “Slave Cloth and Clothing Slaves: Craftsmanship, Commerce, and Industry”, Journal of Early Southern Decorative Arts, Volume 38 (2017), Winston-Salem, NC (Museum of Early Southern Decorative Arts publication).